Dr. Yashanda Scruggs from the GW Center for Career Services will introduce you to GW Career Connects, an internal GW networking resource, as well as Handshake, a service that helps connect students and trainees with potential employers. Dr. Scruggs will also include interview preparation tips that will help you to make the most of these opportunities. Lunch will be provided. Please RSVP to gwpostdoc@gwu.edu if you plan to attend. We will grab a table at Tonic and welcome you to join your fellow postdocs for some well-deserved relaxation (or at least relaxed networking). We hope to see you there! The Georgetown Howard Universities Center for Clinical and Translational Science (GHUCCTS) and the Clinical and Translational Science Institute at Children's National are joining together to host the DC CTSA Consortium Spring Regulatory Update and Hot Topics in Clinical Research symposium. 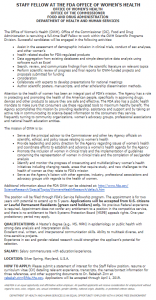 The detailed program is anticipated soon at https://research.gwu.edu/dc-ctsa-consortium-spring-update. Please register by April 24th by emailing resinteg@gwu.edu. And a sneak peak at some May events too! We are continuing our research updates series for both graduate students and postdocs to hear interesting new research and to network afterward with free food. The speaker will be Dr. Rokhaya Faye and she will present on Quantification of Transmural Autonomic System Effects and Arrhythmia Dynamics in Human RVOT". Please RSVP to gwpostdoc@gwu.edu so we can both look forward to seeing you as well as know how much food to acquire! The NIH annual career symposium is an excellent opportunity to explore career options and to network with other scientists in the DMV area! For more information and to register, see here. 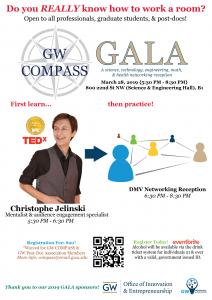 Upcoming GW COMPASS GALA — don’t forget to register! Author jimcdonaldPublished on March 26, 2019 Leave a comment on Upcoming GW COMPASS GALA — don’t forget to register! 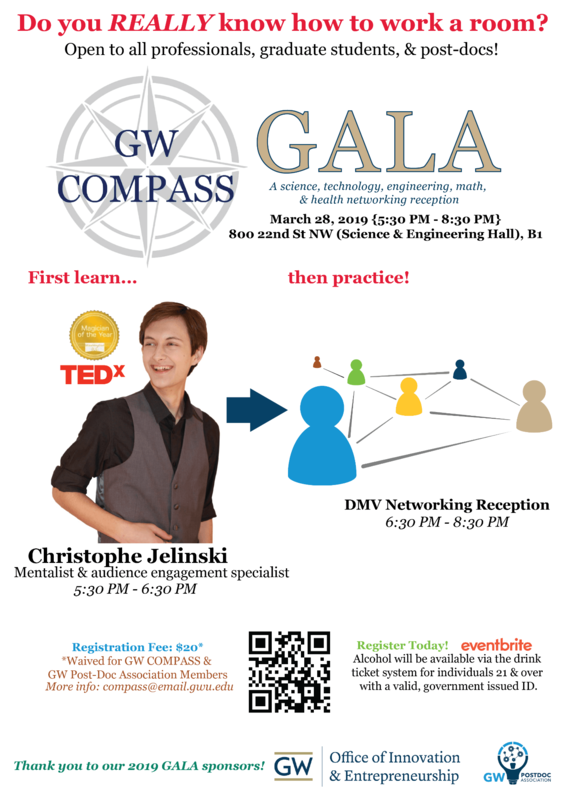 This Thursday, GW COMPASS is holding it's GALA networking event with a session about how to work a room led by Christophe Jelinski before several hours of networking. Please see the flier below and don't forget to register ahead of time. We hope to see you there! Published on March 26, 2019 Author jimcdonaldLeave a comment on Upcoming GW COMPASS GALA — don’t forget to register! 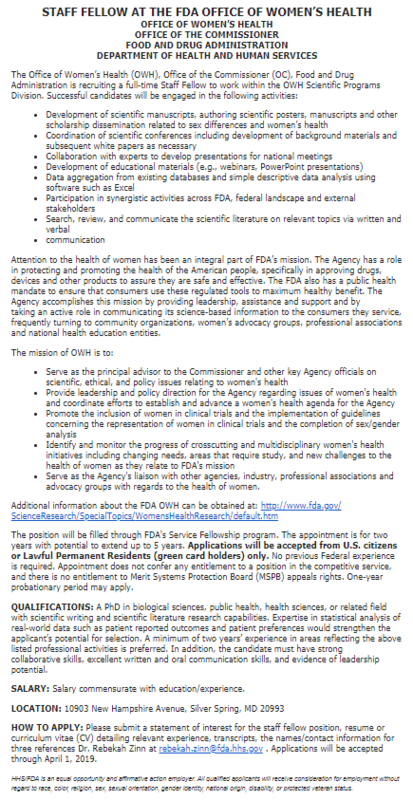 We have been alerted to two job postings at the FDA Office of Women's Health that may interest you. Details are below. Time is marching on, and we have several exciting events that we wanted to let you know about. We look forward to seeing you at them! The GWPA is hosting a time management workshop led by Dr. Sara Melita. Dr. Melita works for GW’s Colonial Temps team providing career development advice as a consultant, executive coach, facilitator, and trainer. Come join us for food and some pointers on how to make the most of your time! Close out the week with a belated Mardi Gras party feature crepes and friendly fellow postdocs! The GWPA is hosting a seminar by Dr. Philip Ryan, who works as part of the NIH Office of Intramural Training & Education to help postdocs build the skills they need to succeed in their careers. Come hear his advice pertaining to finding mentors that will help advance your career. The GWPA is offering you the chance to sharpen your presentation skills through informal talks once a month. We are aiming to make this an ideal way to practice for an upcoming conference presentation or to just get feedback on your research. Afterward we'll provide food. Dr. Chiara Manzini will lead a seminar focused on postdoc professional development. Lunch will be provided. 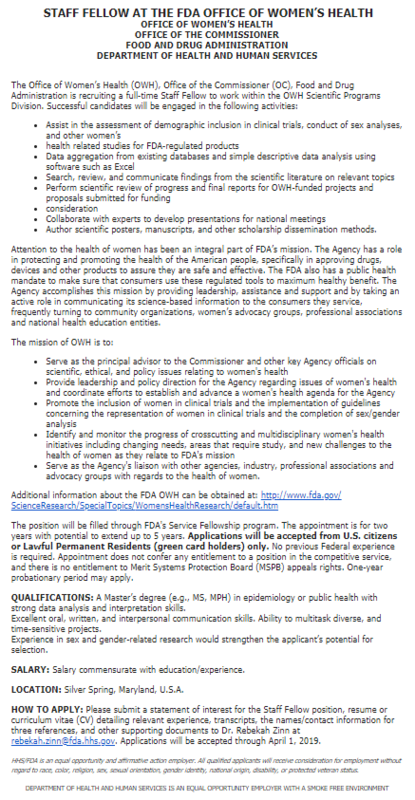 If you are interested please RSVP to Luara Radville (lradville@gwu.edu). Please RSVP to Laura Radville (lradville@gwu.edu)! 4. Lastly, we invite you to eagerly anticipate a Mardis Gras event held on March 8th. Details coming soon!! Come network with fellow postdocs from the DC, Maryland, and Virginia area! Meet the 2019 GWPA board members and enjoy some hot chocolate to drive away the winter chills! Seminar presentation by Anne Banner (Executive Director, Communications and Marketing) and Lisa Anderson (Director of Media Relations & Social Media). Please RSVP to Laura Radville: lradville@gwu.edu. Science Career and Professional Development Series -- "What's in the 'Rest' of Your Fellowship Application?" Dr Alison Hall will be talking about the different components of a successful grant application, for e.g. 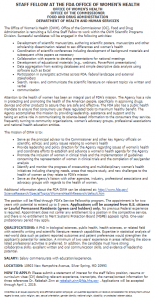 NIH F31/F32! . See attached flyer for more details. With the end of the year fast approaching, let's take some time to relax and celebrate all the wonderful things this year has brought us, with friends and great food. Bring a side dish and a friend or two and join us. The GW Postdoc Appreciation 2018 was a big success!!! Author amacedoPublished on October 1, 2018 October 28, 2018 Leave a comment on The GW Postdoc Appreciation 2018 was a big success!!! Thank you for participating in the GW Postdoc Appreciation 2018. It was a great experience for us and we hope you got a lot out of it too. Please do reach out to us, to let us know what you liked, what you disliked and what you'd like to do differently next year. For those who missed out, Dr Josh Henkin spoke to us about a variety of non-academic career options for postdocs and tools to identify them in his Keynote address titled "Now, Pick A Winning Career" (National Postdoc Appreciation Week). His slides have been uploaded here in our our website (https://postdocs.gwu.edu/resources/). We had 13 amazing presentations by GW Postdocs. Winners of the Research Presentation Competition are listed below. Our career networking lunch featured a panel of 5 guests who've pursued a variety of non-traditional career paths after their postdocs. They shared with us their experiences and what they've learnt in a lively and interactive discussion session. Finally, if you haven't picked up a copy of our September bulletin, please find it attached here. This month we've included a list of all GW faculty who were nominated for the Mentor Award and their comments on effective mentoring. Want to read more about the event? Published on October 1, 2018 October 28, 2018 Author amacedoLeave a comment on The GW Postdoc Appreciation 2018 was a big success!!! The Department of Exercise and Nutrition Sciences is happy to announce the Fall 2018 schedule of free faculty and staff group exercise classes. Classes will be offered from Monday, August 27th, 2018, through Thursday, December 20th, 2018* at the Foggy Bottom campus. Prepare to give it your all for 30 minutes. Learn to find peace in stress. To be eligible for these classes, the designation on your GWorld card must list Faculty or Staff. Please arrive to class on time. Since our first ice cream social was so popular, please meet us again on the 5th floor of SEH (in the West Kitchenette- signs will be posted on the 5th floor) for a free bowl of ice cream, this time with even MORE flavors and toppings! Please RSVP with a quick email to gwpostdoc@gmail.com. Learn how to manage your stresses and anxiety for a more productive lifestyle! This seminar will feature a speaker from the Colonial Health Center. Lunch will be provided. Please RSVP with a quick email to gwpostdoc@gmail.com.